Broadway has a habit, for better or worse, of following Hollywood trends. This year’s blockbuster line-up was full of YA, or young adult, novel adaptations from The Fault in Our Stars to Maze Runner and If I Stay, not to mention the highly-anticipated The Hunger Games: Mockingjay Part 1. YA novel adaptations have been popular on Broadway for years with successful adaptations of Little Women and The Secret Garden, and Matilda. The stage adaptation of The Curious Incident of the Dog in the Night-Time also recently started previews, and the Public Theater’s popular adaptation of Alison Bechdel’s Fun Home will get a Broadway run at Circle in the Square. If Charlie and the Chocolate Factory does well enough in London, author Roald Dahl could very soon have two musicals playing on Broadway based on his books. All of these YA novel adaptations on-screen and on-stage got me thinking about books I would love to see adapted as musicals. Which childhood classics and coming-of-age stories should get the Broadway treatment? Read on to find out. In no particular order, here are the top 15 YA books that would make great musicals. 15. The Fault in Our Stars – “Okay?” “Okay.” John Green’s book about teens finding love at their cancer support group was hugely popular with readers and theater-goers, beating out Tom Cruise’s latest sci-fi action film Edge of Tomorrow at the box office in their shared opening weekend. 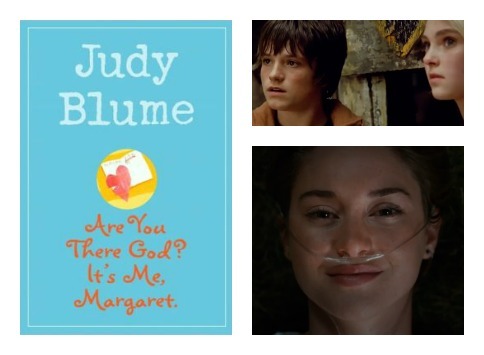 The humor is sharp and often dark, but when Hazel and Augustus have to face their own mortality, it is truly tragic. If I could pick the dream team to adapt The Fault in Our Stars for Broadway, it would be Brian Yorkey and Tom Kitt of Next to Normal. “My Psychopharmacologist and I” turned a series of doctor’s visits into a hilarious parody of “My Favorite Things” from The Sound of Music. “Zoloft and Paxil and Buspar and Xanax/Depakote, Klonopin, Ambien, Prozac/Atavan calms me when I see the bills/These are a few of my favorite pills.” I can only imagine what they would do with Hazel and Augustus’ support group, particularly their group leader Patrick who lost his testicles to cancer. 14. Bridge to Terabithia – Filmmakers have twice attempted to adapt Bridge to Terabithia with rather disappointing results. I think the reason why these adaptations never succeeded is that film cannot get the audience inside of Jesse’s head without corny voice-overs, and Jesse’s struggle to appear masculine to his friends and father while still finding escape in his art is lost. Solution: Sing your feelings! And who better to write those feelings than Jason Robert Brown? He is familiar with coming-of-age stories with 13, a musical centering on the main character’s impending bar mitzvah, and some of his best songs are about loss and heartbreak. There is a reason why “It All Fades Away” is one of the most-played songs on my iPod. Steven Pasquaaaaaaale! Gaaah, the feels! 12. A Wrinkle in Time – Madeleine L’Engle’s A Wrinkle in Time is a classic book that transcends the YA label, and it blew my mind when I read it in fourth grade. I have absolutely no idea how to adapt it for the stage, but I have one piece of advice for anyone who wants to try: Give it to Alex Timbers. If anyone can make it work on-stage, it is him. 11. Ella Enchanted – A stage musical adaptation of Ella Enchanted would be a brilliant move for Disney Theatrical. Like Frozen, the original book Ella Enchanted is a clever twist on the usual fairy tale, but it doesn’t stray into territory that would make Disney execs nervous. Alan Menken can write the music, and after his spectacular work on the book for Rodgers and Hammerstein’s Cinderella, Douglas Carter Beane can write the book. Are Laura Osnes and Santino Fontana available? Ella Enchanted can be a big, beautiful Cinderella reunion! Stay tuned for #6 thru #10, including more YA classics by Louis Sachar, David Levithan, Jerry Spinelli, Stephen Chbosky, and Judy Blume. Readers, which classic YA novels do you want to see on Broadway? Leave a comment below, and let me know what you think of the list so far! For more Broadway news, commentary, and tips for finding affordable Broadway theater tickets, follow Ludus NYC on Twitter, like Ludus NYC on Facebook, and subscribe to Ludus NYC on YouTube! ← How-To Broadway: What is Tix 4 Students?